JEFFERSON CITY, Mo. 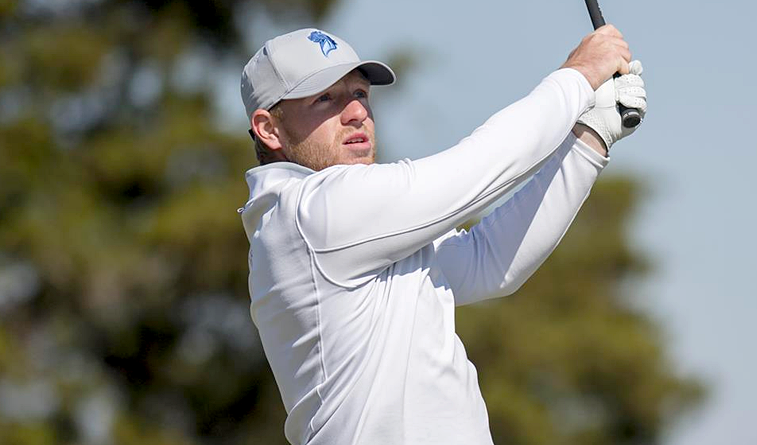 (Oct. 16) – Blake Murray tied for second in the individual race to lead Central Oklahoma to a fifth-place showing in the Blue Tiger Invitational that concluded Tuesday. Northeastern State finished seventh in its final fall tournament. Murray followed up Monday’s 1-under-par 71 with an even-par 72 in finishing with a 143 total and ended up just one shot behind winner Lindenwood’s Yente Van Doren. The Bronchos closed with a 297 at the 7,117-yard, par-72 Jefferson City Country Club to finish the two-day, 36-hole tournament with a 596 total. Henderson State won the 18-team event at 585, followed by Lindenwood (590), Winona State (595), Central Missouri (595) and UCO. Holden Crago backed up Murray’s even-par round with a 73, while Yannic Oppenheimerand Jacob Lackey both shot 76. Joe Lemieux added a 77 and Kylian Cavdar shot 76 competing as an individual medalist. Murray is in his first year with the Bronchos and the runner-up showing was his best finish in four tournaments this fall. The junior had three birdies, three bogeys and three pars in a front-nine 36, then offset a bogey on No. 14 with a birdie on the par-4 18th in coming back with another 36. Crago made the turn at two-over 38, but got back to even-par with birdies on Nos. 10 and 12 before bogeying No. 14 in shooting a back-nine 35. The Bronchos finish their fall season next Monday and Tuesday at the Miami Intercollegiate in Miami, Fla.
Northeastern State climbed up two spots on the team leader board to finish seventh at the Blue Tiger Invitational on Tuesday. Grant Hynes led the way for the RiverHawks with a 147 (76-71) and was tied for 11th overall at the Jefferson City Country Club. The RiverHawks shaved off 14 strokes from their first round to score a 606 (310-296) in their fall finale. Tyler Ashman came away tied for 19th with a 150 (77-73), Carlos Gomez was a stroke back (75-76) tied for 23rd on the leader board. Griffen Matthias scored a 160 (84-76) and Jax Johnson had a 161 (82-79). Henderson State was team champions by five shots over Lindenwood on a 585 (289-296) score. The Lions’ Yente Van Doren took medalist honors after firing off a 142 (72-70). The RiverHawks will return on action on Feb. 25-26 where they will play in the Rattler Invitational in San Antonio, Texas.